Cast: Mark Hamill ( Luke Skywalker ); Harrison Ford ( Han Solo ); Carrie Fisher ( Princess Leia Ograna ); Alec Guinness ( Ben "Obiwan" Kenobi ); Peter Cushing ( Grand Moff Tarkin ); David Prowse ( Lord Darth Vader , voice by James Earl Jones); Kenny Baker ( R2-D2 ); Anthony Daniels ( C-3PO ); Peter Mayhew ( Chewbacca ). Lucas, George, Star Wars: A New Hope , New York, 1999. McConnell, Frank, Storytelling and Mythmaking: Images in Film and Literature , New York, 1979. Hunter, Allan, Alec Guinness on Screen , London, 1982. Short, Robert, The Gospel from Outer Space , San Francisco, 1983. Velasco, Raymond L., A Guide to the Star Wars Universe , New York, 1984. Austin, Bruce A., Current Research in Film: Audiences, Economics and Law, Volume 1 , Norwood, New Jersey, 1985. Von Gunden, Kenneth, Alec Guinness: The Films , Jefferson, North Carolina, 1987. Rosenbaum, Jonathan, "The Solitary Pleasures of Star Wars ," in Sight and Sound (London), Autumn 1977. Clouzot, C., "Le Matin du magicien: George Lucas et Star Wars, " in Ecran (Paris), September 1977. Nicholson, D. W., "Special Effects in Star Wars ," in Cinema Papers (Melbourne), October 1977. Wood, Denis, "The Stars in Our Hearts—A Critical Commentary on George Lucas's Star Wars, " in Journal of Popular Film (Washington, D.C.), no. 3, 1978. Roth, L., "Bergsonian Comedy and the Human Machine in Star Wars ," in Film Criticism (Edinboro, Pennsylvania), Winter 1979. Hirayama, Ruth L., in Magill's Survey of Cinema 4 , Englewood Cliffs, New Jersey, 1980. Lafficier, Randy and Jean-Marc, "Les Origines de Star Wars ," in Ecran Fantastique (Paris), April 1983. Harmetz, Aljean, "Burden of Dreams: George Lucas," in American Film (Washington, D.C.), June 1983. Meyer, D. S., "Star Wars, Star Wars , and American Political Culture," in Journal of Popular Culture (Bowling Green, Ohio), no. 2, 1992. Cast: Mark Hamill ( Luke Skywalker ); Harrison Ford ( Han Solo ); Carrie Fisher ( Princess Leia ); David Prowse ( Lord Darth Vader , voice by James Earl Jones); Anthony Daniels ( C-3PO ); Peter Mayhew ( Chewbacca ); Kenny Baker ( R2-D2 ); Frank Oz ( Voice and mechanical workings of Yoda ); Billy Dee Williams ( Lando Calrissian ); Alec Guinness ( Ben "Obi-wan" Kenobi ). Brackett, Leigh, Lawrence Kasdan, and George Lucas, The Empire Strikes Back: Script Facsimile , Los Angeles, 1998. Arnold, Alan, Once Upon a Galaxy: A Journal of the Making of "The Empire Strikes Back," New York, 1980. Smith, Thomas G., Industrial Light and Magic: The Art of Special Effects , New York, 1986. Vallerand, F., "John Williams et The Empire Strikes Back, " in Séquences (Montreal), July 1980. Gordon, Andrew, "The Empire Strikes Back: Monsters from the Id," in Science Fiction Studies , November 1980. 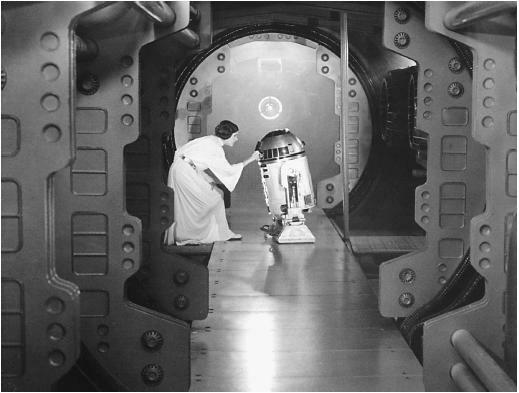 Lancashire, Anne, "Complex Design in The Empire Strikes Back, " in Film Criticism (Edinboro, Pennsylvania), Spring 1981. Cast: Mark Hamill ( Luke Skywalker ); Harrison Ford ( Han Solo ); Carrie Fisher ( Princess Leia ); Billy Dee Williams ( Lando Calrissian ); Anthony Daniels ( C-3PO ); Kenny Baker ( R2-D2 and Paploo ); Peter Mayhew ( Chewbacca ); Ian McDiarmid ( The Emperor ); David Prowse ( Darth Vader , voice by James Earl Jones); Sebastian Shaw ( Anakin Skywalker ); Warwick Davis ( Wicket ); Michael Carter ( Bib Fortuna ); Denis Lawson ( Wedge ); Alec Guinness ( Ben "Obi-wan" Kenobi ). Crawley, Tony, "The Making of The Return of the Jedi, " in Starburst (London), July 1983. Cast: Liam Neeson ( Qui-Gon Jinn ); Ewan McGregor ( Obi-Wan Kenobi ); Natalie Portman ( Queen Amidala/Padmé Naberrie ); Jake Lloyd ( Anakin Skywalker ); Ian McDiarmid ( Naboo Senator Cos Palpatine/Darth Sidious ); Pernilla August ( Schmi Skywalker ); Oliver Ford Davies ( Governor Sio Bibble ); Hugh Quarshie ( Captain Panaka ); Ahmed Best (voice of Jar Jar Binks / Senator ); Anthony Daniels ( C-3PO ); Kenny Baker ( R2-D2 ); Frank Oz (voice of Yoda ); Terence Stamp ( Chancellor Finis Valorum ); Brian Blessed ( Boss Nass ); Andrew Secombe ( Watto ); Ray Park ( Darth Maul ). Lucas, George, Star Wars Episode I The Phantom Menace: Script Facsimile , Los Angeles, 2000. Pollock, Dale, Skywalking: The Life and Films of George Lucas , New York, 1999. Cavelos, Jeanne, The Science of Star Wars: An Astrophysicist's Independent Examination of Space Travel, Aliens, and Robots as Portrayed in the Star Wars Films , New York, 1999. Anderson, Kevin J., and Daniel Wallace, Star Wars: The Essential Chronology , Los Angeles, 2000. Blake, Larry, "Finishing The Phantom Menace —The Complete Post-Production for Star Wars Episode I ," in Mix (Berkeley), 1 May 1999. Robertson, Barbara, "Behind the Screens," in Computer Graphics World (San Francisco), 1 August 1999. Doherty, Thomas, "Star Wars: The Phantom Menace," in Cinefantastique , 1 October 1999. The Disneyesque creator behind the films is George Lucas, who used the success of American Graffiti as a springboard for the production of the first Star Wars film, subtitled A New Hope. Lucas retained the rights to future Star Wars films and produced two sequels in the 1980s, subtitled The Empire Strikes Back and Return of the Jedi. These three films are the middle trilogy of a tentatively planned nine film opus. The fourth film to be made, The Phantom Menace , which appeared in 1999, begins the sequence, and Lucas has plans to make its two sequels within ten years. Although the series as a whole can be seen as a simple tale of good versus evil, this doesn't do justice to its moral complexity, which is particularly in evidence in the middle trilogy through the character of Luke. Luke's story is not only a fight against the evil Empire, it is also a fight against the evil within himself. His moral dilemma is complicated by the fact, as revealed in The Empire Strikes Back , that the villainous Darth Vader is Luke's father. With their combination of fantastical settings, spectacular special effects and slick action sequences, it is little wonder that these three films captured the imagination of a generation of filmgoers. It was with intense anticipation, then, that early in 1999 fans awaited the release of Episode I: The Phantom Menace , Lucas's first directorial project since A New Hope in 1977. It has been suggested that Lucas has become so involved with the saga that he is no longer able to judge where audiences need help working out the details of the plot. A less charitable view is that he no longer needs to make an effort in order to make money. Nevertheless, many critics look towards the next two films, due out in 2002 and 2005, to make sense of The Phantom Menace. Despite the failings of the latest film, it is inevitable that the next two episodes will be at least as successful at the box office as the others. While the overall concept may have the cultural weight of an Iliad or Odyssey , The Phantom Menace exposes serious narrative limitations in the execution of this modern saga.